I'm not afflicted with a dreamless heart or loveless own that often: Once every 2.7 years, to be exact, when a month has two full moons. Like now, for instance. The first full moon occurred on Dec. 1 at 11:33 p.m. Pacific Time, while the second one -- the blue one -- is scheduled for 11:15 a.m. on the 31st. It gets a little more complicated because the seasons used by the almanac weren't those usually defined by astronomical solstices and equinoxes. Rather, the almanac seasons were based on the establishment of Easter by Roman Catholic clergy, who simply split the length of time between the winter and summer solstices in defining the start of spring. 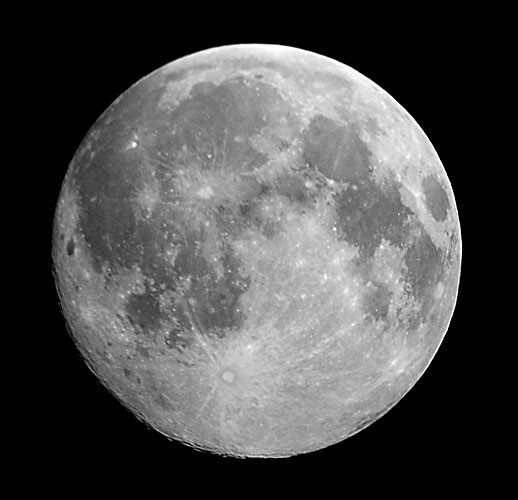 The full moon before Easter was naturally called the Lenten Moon. If an extra moon (beyond the usual three per season) needed to be fitted in before the that one, it was known as the 'Betrayer' moon to differentiate it from the 'true' Lenten moon. 'Betrayer' in Old English is belewe, hence "blue" moon. That at least is one theory for the name. Another possible derivation comes from an English pamphlet from 1528, in which the author simultaneously berates the hubris of the clergy and the gullibility of the laity: Yf they say the mone is belewe / We must believe that it is true. That is, a blue moon is an absurdity, i.e. a 'rarity' (kind of). Take your etymological pick. Following the 1937 magazine article, the idea that the second of two full moons in a month was blue (rather than the third of four full moons in a season) gained traction. These days, it's pretty well accepted, and I have no hesitation in wishing you a Happy New Year's Eve Blue Moon. Barry Evans (barryevans9@yahoo.com) saves his blues for the new moon. He lives in Old Town Eureka.